Dear António, it's a real pleasure to interview the co-author of the well known Newsletter "The ConeShell Collector" (TCC). 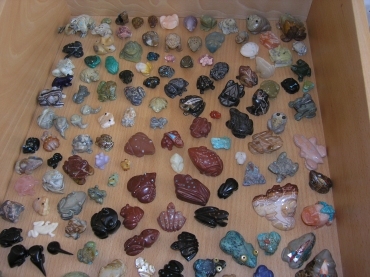 When did you start collecting shells, and what influenced you to start this hobby ? Dear David, first of all let me state that I am very pleased and honoured to be interviewed for your wonderful website, certainly one of the most beautiful and interesting of all sites dedicated to shell collectors! I have collected shells for as long as I can remember – and that of course encompasses most of the almost 59 years I have lived so far. As a child I used to search for shells whenever I went to the beach with my mother – my father having unfortunately passed away very young – and the tide was low. In those days, at the beaches near Lisbon, my hometown, one could find many dead shells, which I saw as something of a treasure. Over my entire life I have had a fascination with the natural world. Visits to the local aquarium or the zoo were always among my favourite occupations – and as a matter of fact I still enjoy myself immensely there. My interest in animals led me to capture and collect many different ones, from frogs to butterflies and other insects. But for one reason or another, shells were always among the ones that interested me most. It must also be said that I am a compulsive collector! Along the years I came to realize that one is born a collector and cannot become one of his own will. 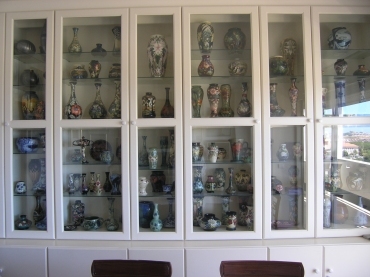 In my case, I currently collect several other items besides shells, including stamps, Portuguese Bank notes, antique belt buckles, frog figurines, antique picture postcards, Moorcroft pottery, etc. 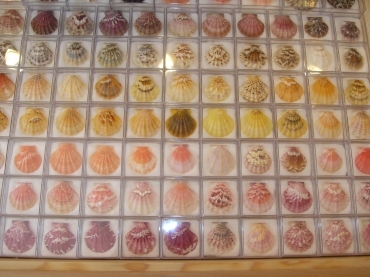 Have you always specialized in cone shells, or did you collect other families? When I was about 16 years old or so – after the childhood phase of picking up dead shells on the beach –, I began to collect shells more seriously and I collected every family: Gastropods, Bivalves, Chitons, Dentaliums, you name it! And I collected not only marine shells but also land snails and fresh water specimens. I began to buy books – not that there were that many available at the time –, to join shell clubs and to subscribe to magazines, and to correspond with dozens and dozens of collectors from all over the world. I often say that besides collecting shells I also collect friends – and I would be hard put to say which pleases me most. Within a few years, my collection had grown into the tens of thousands and not only was I finding it increasingly difficult to know everything I got in any detail, but finding enough room to house the collection in a relatively small apartment was getting progressively harder. That’s why at a certain point I decided to specialize. The whole process was slow and gradual. I remember that in a first stage I kept a number of groups, including Olividae and Strombidae (I already had rather advanced collections of both families), as well as Rissoidae, Columbellidae, Mitridae and a few others; moreover, I held for a long time to my extensive collection of land snails, which I have always loved. 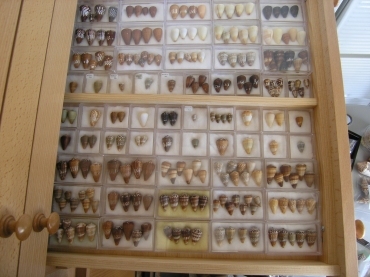 I believe I had a relatively large collection of land snails (including a few species already extinct) and at a certain moment, I and an U.S. friend envisaged the possibility of creating an International Land Shells Collectors’ Club! Unfortunately, the project didn’t go ahead. If cone shells have not always been your interest, what is the attraction they hold for you, and which family captured your interest and enticed you to start? As explained above, during my first years as a shell collector all families interested me. However, cones were always among my favourites. I guess it would not be easy to pinpoint the reasons for such preference. For one thing, there was a large number of species, many of them readily available and not too expensive, while many such species were highly variable, allowing for and even requiring a short series instead of merely one or two specimens. On the other hand, the group included a relatively large number of species that produced some of the most famous and most beautiful shells in the world. 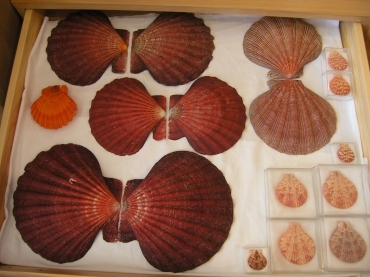 I should perhaps stress at this point that, although I have never neglected the more scientific aspects of shell collecting, my main drive has always been an aesthetic one. I believe that most, if not all collectors will share this feeling of admiration at the sheer beauty of Nature and its creatures. I should also add that relatively soon in my shell collecting I had the opportunity of examining cone specimens collected in different West African locations, some of which clearly undescribed. That of course opened up fascinating possibilities of study, to try to make sense of such specimens. What was your inspiration in launching “TCC”? Many years ago, I had had some experience as editor of the newsletter of the (now extinct) Portuguese Malacological Society. After the Society had folded up, I began to publish a newsletter for Portuguese collectors; it is entitled “O Búzio” (roughly: “The Snail”) and is published every other month. This publication has been going on for about twelve years now. At the same time, correspondence with several friends – such as Mike Filmer, Manuel Jimenez Tenorio, Paul Kersten, etc. –, through e-mail made me realize that the cone world was in permanent activity and that there were lots of ideas, news, etc., that it would be nice to share amongst collectors of cone shells. The Internet made the whole thing possible, as it would not be affordable to do it in classical terms (printed publication, etc.). Are you the primary author, or do you have others that aid you with your website, like André Poremski? I am in fact the primary responsible for TCC. I establish contacts with most authors, decide what to include in each issue, organize the whole thing and manage the mailing list. From the beginning I invited Paul Kersten to act as co-editor, a position he kindly accepted. Paul provides different contacts, suggests subjects to be included, takes care of the section on “newly described taxa” and does the final revision of each issue. The first issues were aesthetically rather poor, because I did not have the expertise to do otherwise. André Poremski then volunteered to use his skills to turn a modest newsletter into something we can really be proud of, from the point of view of visual appeal and graphical display. His work has been highly commended by everyone. So, this is the team that brings TCC to its readers four times a year. But obviously we would be unable to keep it up without the support of the many authors who regularly send in articles for publication. I do not wish TCC to be a sort of tribune for a few enlightened few; quite on the contrary, my aim is for the newsletter to be an open forum wherein professional biologists, advanced collectors and beginners alike can find points of interest. While welcoming and even encouraging academic discussions, TCC is primarily aimed at the collector and I believe we have achieved a good balance so as to please everybody. I guess that creating such a high quality newsletter takes a lot of time? It does, yes! But in Portugal we have a saying that goes more or less like this: who runs for pleasure does not get tired. Preparing the newsletter has become a very pleasing and fulfilling part of my hobby of collecting cone shells. I learn a lot and I get to keep in touch with many friends worldwide. As long as we can keep up the same quality levels, the publication will go on. Do you have an idea of how many collectors read the Newsletter from your mailing list? TCC’s mailing list includes about 200 addresses. However, a few friends – such as yourself – also are kind enough to upload it on their web sites. 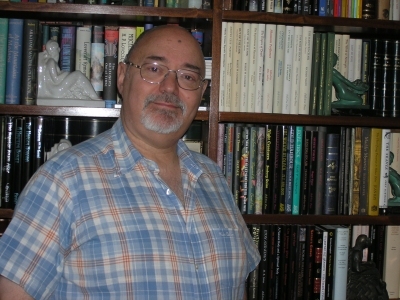 At the same time, André Poremski has also created TCC’s own site (www.theconecollector.com). This means that many more readers have access to the newsletter without necessarily getting in touch with me directly. Let me tell you this: when I launched the TCC project I got in touch with everybody I knew who could eventually be interested in joining the mailing list; those in turn got in touch with others and soon I began to receive e-mails from collectors simply asking that their addresses were added to the list. That of course gave me great pleasure and made TCC into a big success. But I don’t mind telling you that the message that gave me the most pleasure came from a collector (who shall remain nameless here) who told me “I do not collect cones, but I find this project so interesting that I want to be in the mailing list too”. Do you have projects for “TCC”? I have never been short of ideas and projects! When it comes to TCC, the main point is of course to keep it going with the same level of quality that I believe we have achieved (and the current average number of pages per issue, which we have managed to keep much above what I had initially imagined). There are other ideas, of course. Something special – which I think will interest and rather surprise our readers – is under preparation even as I answer your questions, David. Perhaps some day we can contemplate the publication in book form of something like “The Best of TCC”, or something to the same effect. More than anything else, the newsletter will always welcome suggestions from its readers about what they would like to see done within its pages or as part of the same project. You launched another project: the Stuttgart Cone Shell Meeting. What was your inspiration? Shells collectors – and cone collectors in particular – surely enjoy meeting and “talking shells”. Many of us attend Shells Shows at different locations more or less regularly and there is always much to discuss, much to see and much to learn from one another. The idea of an international meeting of cone collectors and scholars first appeared in conversations I had with Manuel Jimenez Tenorio and Bill Fenzan, but at first we did not see a truly effective way to put such an idea into practice. Then, about a year ago, give or take a few months, Bill Fenzan mentioned the idea to Hans-Jörg Niederhöfer, during a visit to the Staatliches Museum für Naturkunde, in Stuttgart (Germany). To everybody’s delight, the latter put the Museum at our disposal for the occasion! With such powerful support, there was just one thing I could say to the whole idea: “Let’s do it!”. Do you do all of the shell collecting yourself? I must disappoint you there, David: although years ago I have collected many shells in several locations along the Portuguese coast, I do not dive and do not travel much (for instance, I have never been to the tropics). I am probably the only cone collector in the world who has never collected a living cone! 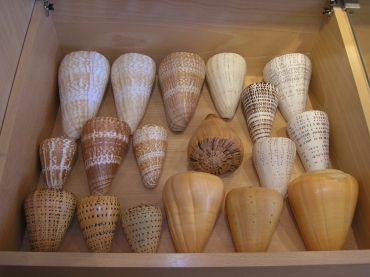 Would you tell us which are your ten favourite cone shells and why? 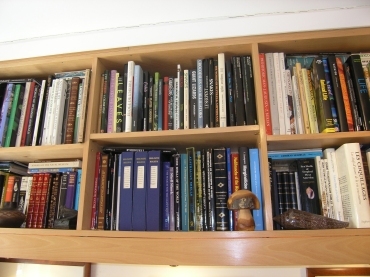 What reference books do you regularly use concerning cone shells? Modern times have brought us any number of fascinating volumes, illustrated with colour photography of amazing quality – we have finally been able to match the sheer quality of several 18th and 19th centuries books, such as Kiener’s Spécies général et Iconographie des coquilles vivantes. It should be stressed that we currently are lucky to have this and many other classical titles available on line! To answer your question, I’m afraid I cannot be particularly original: I use Röckel, Korn and Kohn’s Manual of the Living Conidae, of course, and I am quite sorry that the authors stopped at volume one; I also find Mike Filmer’s A Catalogue of Nomenclature and Taxonomy in the Living Conidae, 1758-1998 to be invaluable. If I may quote myself, I use the volumes I prepared with my friend Manuel Jimenez Tenorio for A Conchological Iconography, when it comes to West or South-African species, and I am just getting use the recent classification proposed by John Tucker and Manuel J. Tenorio. And of course in the 21st century we must not forget useful websites, of which I will mention but one, Paul Kersten’s “An Illustrated Checklist of Recent Conidae”. Still speaking of books, what we really lack at the moment is a good revision of Western Atlantic cones. A hard task, to be sure, but much needed.